USS Macaw at slip 7, Moore Drydock Company, 12 July 1942. Credit: NARA. It would be difficult to overestimate the impact of World War II on Hawaii and the Pacific. Events during the 1940's changed the shape of the entire region. During those years, the Hawaiian Islands were attacked twice: once on December 7th, 1941 when carrier-based planes of the Japanese Imperial Navy struck at Pearl Harbor and other military targets on the island of Oahu, and again on June 4th-6th, 1942 when the Imperial Navy's Midway Island invasion force was repelled by what remained of the U.S. Pacific Fleet. Many are aware of the Battle of Midway in 1942 and the crucial development of naval aviation tactics. The newly established Naval Air Facility at Midway, a distant atoll within the Northwestern Hawaiian Islands which had been claimed by the U.S. Navy in 1867, played a critical role in defense during that attack. Fewer may know of the subsequent part played by the tiny island during the war. In addition to a naval air facility, Midway became an important submarine base. American submarines, making the long trek from Pearl Harbor to the Sea of Japan, were able to refuel and refit at Midway Atoll, cutting some 2,400 miles off of their passage. 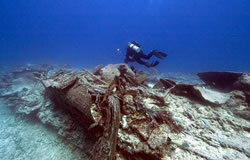 Maritime archaeologist investigates the tangled wreckage of the USS Macaw at Midway. Credit: NOAA/Casserley. Today the historic buildings and runways and anti-aircraft guns on shore are the visible monuments to Midway Island's aviation past. But beneath the surface of the near shore waters, there lies a monument (of sorts) to the island's association with the "silent service." 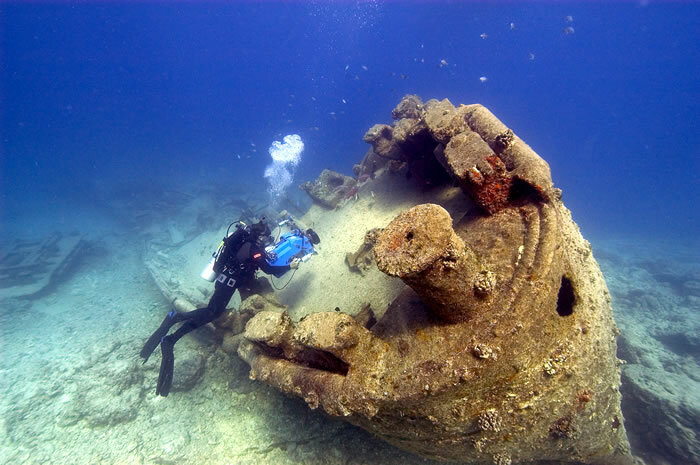 The wreck of the submarine rescue and salvage vessel USS Macaw ASR-11, a Guardian of the Submarines, rests on the bottom of the atoll's channel. Submarine Rescue Vessels, or ASRs, have typically served the Navy in a variety of roles. Not only were they highly specialized salvage, diving, and rescue ships, but they also accompanied all submarines going to sea on trials, recovered practice torpedoes, and stood by for emergency rescue operations. Chanticleer class World War II era ASR vessels were capable of supporting McCann rescue chamber operations (also called the "submarine rescue chamber" or SRC) and deep sea diving operations indefinitely down to 380 feet. 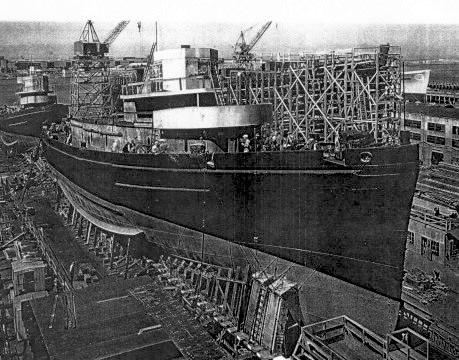 Only a handful of ships were ever laid down and built as Chanticleer class rescue vessels. Macaw ASR-11 received her commission on July 12th, 1943. Poised for the invasion of the Marshall Islands, the ship was transiting back to Honolulu due to contaminated water tanks when she stopped at Midway. Suddenly on January 18th, 1944 the Macaw received orders to rescue a submarine from a nearby reef. Headed out on patrol, 20-35 knot winds from the west and rough seas had pushed the Flier SS-250 onto the coral reef. Attempting to get a line to the stricken sub, the Macaw herself, under the command of the Midway harbor pilot, ran aground. Very soon the motor room and generator room were flooded with diesel oil and sea water. Breakers began striking the stern of the ship. Approximately 25 feet of Macaw's stern projected into the channel which, though not an immediate obstruction, threatened to further restrict passage. Keeping the channel clear was a high priority. Midway could not afford to be closed to submarine operations in 1944. 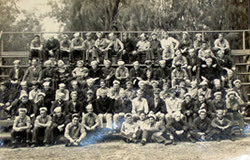 Crew photo of the USS Macaw. Courtesy of: Susan Hayes. Salvage attempts on the Macaw began as soon as possible. The USS Clamp, arriving 24 January 24th, placed a crew on board Macaw after Flier was freed from the reef. Three separate attempts were finally made to refloat Macaw and pull her off, all without success. Weather continued to hamper salvage work during the first week of February. Attempts to provision the crew on board the wreck were difficult and sometimes impossible. Wind and seas during the night of February 11th increased to a full gale. During the following day Macaw took on a heavy starboard list. 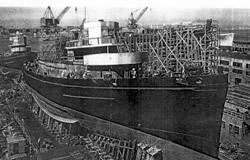 Seas at the wreck site increased to an estimated height of 30 feet and began breaking over the ship's superstructure. By 6:00 PM the pronounced list was suddenly reduced as Macaw's stern swung south and submerged in deeper water. Urgent messages were sent to the crew on board the wreck not to attempt to abandon ship as it was felt that all would be killed on the coral reef or possibly even before clearing the vessel. All communication with Macaw was lost at 9:00 PM as the pilothouse began to be submerged by breaking seas. Search lights were trained on the site, and search-and-rescue parties were organized ashore on Eastern Island. The commanding officer, executive officer, and 20 Macaw crewmen remained on board during the night of the 12th. Now they were trapped. With deteriorating conditions, they were soon forced to take shelter in the pilothouse. By 2:30 AM the air inside the sealed compartment became foul. Personnel on shore observed men climbing into the crow's nest on the foremast. The Macaw crew was forced to abandon ship into the heavy treacherous seas. Two 33-foot boats from Midway naval operating base capsized during rescue attempts, with the loss of three lives. Searches during the following day recovered seventeen Macaw crewmen from atoll beaches, buoys, and distant spots in the lagoon. The following Macaw personnel were reported missing in the line of duty: Lieutenant Commander Paul Willits Burton USN (CO); William Roscoe Funk USNR; Lewis Andrew Kingsley USNR; Robert Andrew Vaughn USNR; and Donald Ashley Whitmarsh USNR. Following the storm and sinking of the USS Macaw, the decision was eventually made to clear the channel and level the hulk of the Macaw in place. 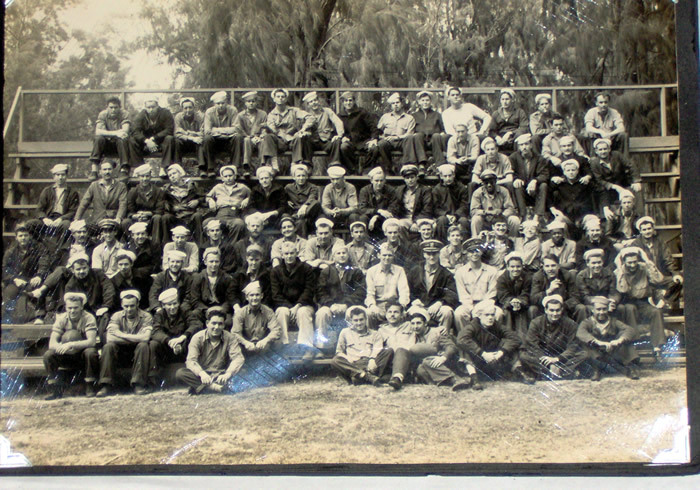 The crew from the USS Shackle ARS-9 worked on the site through September 9th 1944. 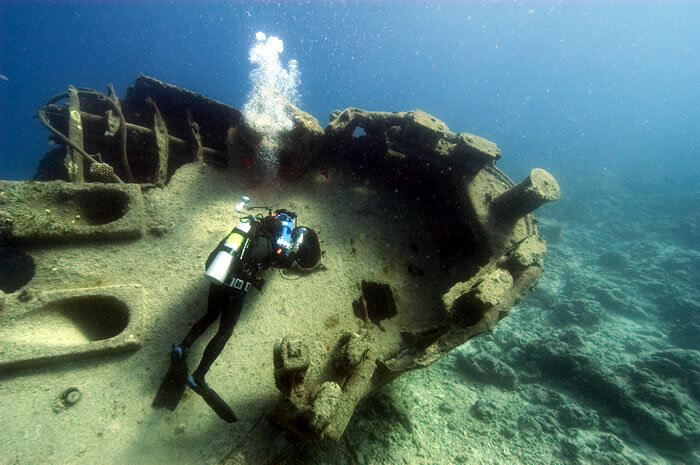 A total of 1,086 diving hours were spent salvaging equipment and materials and placing demolition charges. More than two and one-half tons of explosives were used. The wreck site is located on the eastern side of the main channel at Midway atoll, relatively close to the harbor on Sand Island. The evidence on months of hard work, thousands of pounds of explosives, and hundreds of dive-hours by the salvage crew of USS Shackle is plain. 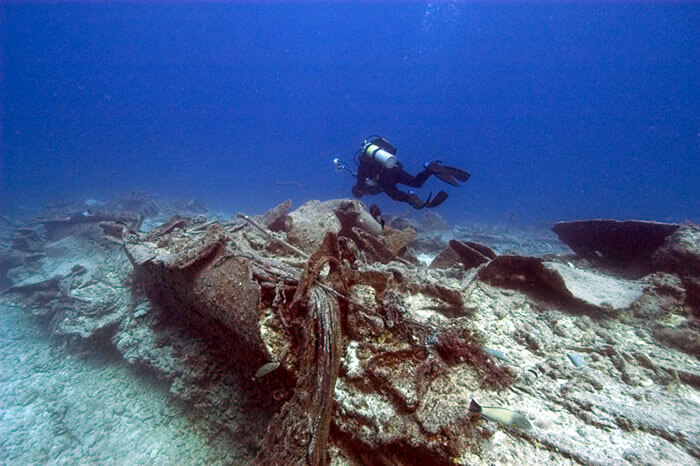 In 2003 NOAA maritime archaeologists Hans Van Tilburg and Kelly Gleason, with Education Coordinator Andy Collins, completed the photo mosaic and non-invasive survey of the USS Macaw. The wreck site is both striking and extensive. The bow section remains prominent and relatively intact. The site extends from the bow in approximately 25 feet of water near the channel's edge, to the stern which extends into the sandy channel in approximately 55 feet of water. Numerous fish and invertebrates have found shelter within and among the debris. John Brooks filming the bow of the USS Macaw. Credit: NOAA/Schwemmer. Though in places the Macaw is almost unrecognizable as a ship, the site today opens the door on a portion of our maritime past: the nature of operations during World War II in the Pacific, salvage and storm in 1944, and the importance of Midway Island as a submarine base. As a naval vessel, the artifacts of the Macaw remain property of the federal government. 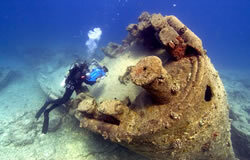 The wreck lies within the Midway Atoll National Wildlife Refuge (U.S. Fish and Wildlife Service), and the Battle of Midway National Memorial. The area is also managed by the Northwestern Hawaiian Islands marine National Monument. 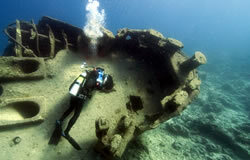 In 2003, a team of maritime archaeologists conducted a preliminary survey of the site and completed a photomosaic of the vessel. In 2005, a team returned to collect high definition video footage. Teams conduct annual monitoring surveys at this site, but due to massive scatter and limited window to work at the site, attempts to collect data for a site plan are ongoing. 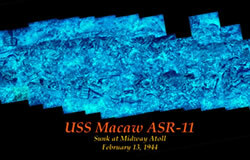 Photomosaic of the USS Macaw created in 2003. Credit: Andy Collins.